Jana's busy lifestyle used to get in the way of her health. 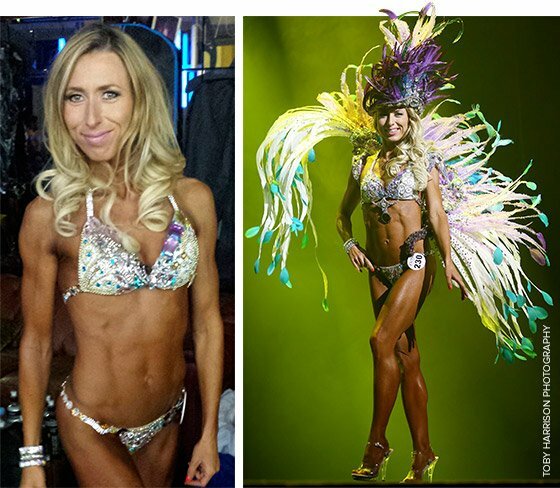 Learn how she made fitness a priority and built a body worthy of the WBFF stage! I've worked in the fitness industry since I was 16 years old. I've always been athletic, and I taught 20 hours of group fitness classes each week for over 12 years. Fitness was my life. I began working out less because I had just started a business and had less time. A few years later, I was hired by a big franchise fitness chain to help them open new gyms. I travelled 6-7 days per week and often spent 12 hours on the road on any given day. While working for that company, I was so busy I struggled to eat clean and stopped training completely. I was just so tired when I got home at night. Within 2-3 years, I'd gained over 20 pounds (10 kg). None of my favorite pants or dresses fit anymore. Some of my coworkers began to ask me if I was pregnant. That shocked me, but it was a turnaround point. I told myself I had to change my life immediately! I didn't want to feel uncomfortable anymore. I remember the date: February 1, 2011. It was just before my 34th birthday. On that day, I began my journey back to a healthy lifestyle. I looked for fitness role models and inspirational people on the web. I printed their photos and stuck them on my wall. I hung my favorite pants where I could see them every day to motivate myself to fit into them again. I started by organizing myself much better. I made time to go to the gym 5-6 times per week, prepared my meals for the whole day and brought food with me when I traveled. When everything was already planned, there was no excuse for me to eat poorly or skip the gym. After the first few months, I'd already lost some weight. "When everything was already planned, there was no excuse for me to eat poorly or skip the gym." I visited a fitness competition camp in April 2011. Some of my friends were there preparing for a competition. They asked me if I would compete with them at the end of the year. My first thought was: "What? Me and competition? Never!" But after thinking about it, I decided to try it. I wanted an adventure and a new experience. I'd spent my whole life teaching clients how to lose fat and build muscle, but competition preparation was an entirely new direction for me. I was motivated to achieve more than just losing the 20 pounds I had gained. My first fitness competition was Ms. Bikini in November 2011. I was in the best shape I had ever been. I was more than happy. After some photo shoots I put my before-after pictures together and showed them to my clients. I told them that if I could do it, they can do it as well. Since that show in 2011, I've set a new fitness goal for myself every year. It's fun to live a healthy lifestyle and to inspire other people. I've continued to compete in fitness competitions. In 2013, I placed in the top ten for Diva Fitness Masters and Diva Fitness Classic at the WBFF show in London. I work out six days per week. During the offseason, I mostly lift weights without cardio. About six months before a competition, I start to include some cardio sessions. I do functional workouts or the spin bike, stairs, treadmill, or outdoor sprints. I train between noon and late afternoon, since that's the time when I feel I have the most power. As I get closer to competition day, I do 2-3 workouts per day. The number of workouts per day depends on what kind of shape I'm in. "Never stop believing in yourself, and never give up!" Dream it. Believe it. Achieve it. Never stop believing in yourself, and never give up! Surround yourself with positive people who support you. Be patient. Nothing happens overnight. If you struggle with training or nutrition, remember why you started. It's better to suffer from discipline than suffer from regret. Put photos of role models in your wardrobe, kitchen, or wherever. Use them to stay motivated to achieve your fitness goal. Stop comparing yourself with others! Everybody is different. Everybody has different genetics. Fitness is a challenge against yourself. The number on your scale doesn't tell you everything. Measure progress by testing your body fat, looking in the mirror, and paying attention to how you feel. Take progress photos every 1-2 months. Don't be afraid of carbs! Good carbs are important in life. Just eat them in the right amount and the right times. Everybody reacts to carbs differently. Swiss food and supplements are very expensive. And the variety of veggies, salads, and fruits is limited in some seasons. I get some of my food from a wholesaler and order products from the USA if they aren't available here.